Hubbell-Wiring Insulgrip® 4-Pole 5-Wire Polarized pin and sleeve receptacle in aluminum color, has voltage rating of 600/250-Volt AC/DC and current rating of 200-Amps. It withstands dielectric voltage rating of 3000-Volt AC. 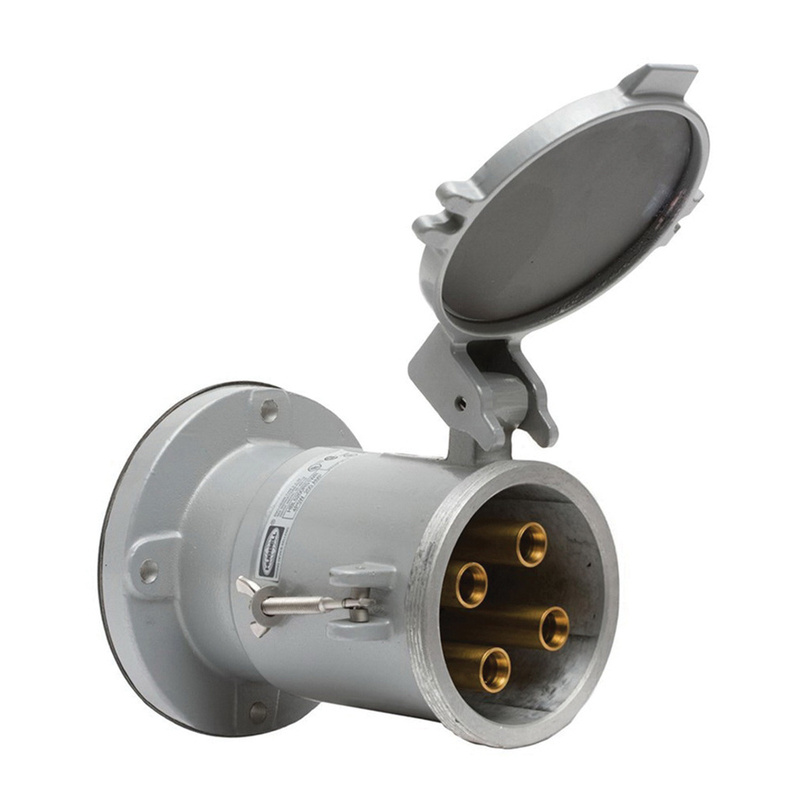 This receptacle accommodates up to 1 - 250-KCMIL copper conductors. The thermoset polyester water-tight receptacle features epoxy painted aluminum construction. It withstands a maximum temperature rise of 30 deg C after 50 cycles OL at 150% rated current. It features epoxy painted aluminum mounting flange and thermoset polyester retainer. Receptacle has stainless steel arm spring, mounting screws and assembly screws. It has aluminum cover screw/rivet and brass ground phase sleeve for electrical contact with mating pins. It has neoprene gasket and epoxy painted aluminum cover arm. Receptacle withstands temperature range of -40 to 75 deg C. It has IP66-degree of protection. It is UL94 V0 flammability rated to withstand harsh environmental conditions. Receptacle is UL listed, CSA/IEC certified and RoHS compliant.